I haven't been here for weeks because I've been busy wrestling my demons. The grief monster swallowed me whole and I've been fighting depression demons as well. I needed some time to think dark thoughts, cry painful tears and to just absorb the still I found myself surrounded with after my dog's sudden death on my son's birthday, only days before the anniversary of my other's son's unexpected death on yet another's son's birthday. I was taking care of my mental health while trying to be present for my children and something had to give. My blog was the first thing to go. In return, my sanity stayed. With the new year, I've got goals, and hopes and big plans for this space. I've words I need to spill, truths I want to tell, and laughs I want to share. But all of that can wait for another day. Today I have something else I want to share with you. A new family member I would like you to meet. 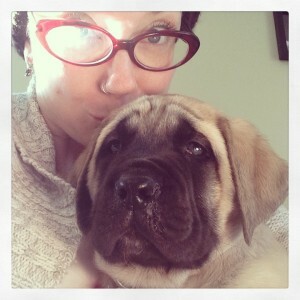 He's twenty odd pounds of eight-week-old puppy adorable English Mastiff goodness. 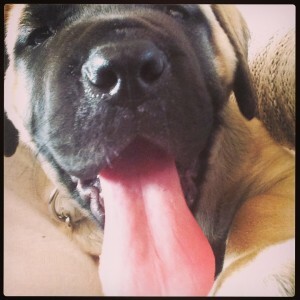 He's going to grow up to be an awful lot of dog, if his parents are any indication. I wasn't sure a new dog was the right avenue to take, what with my love of Nixon being so fierce and true, but it's funny how the heart works. 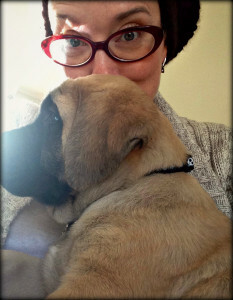 New love just sort of seeps into the cracks of your heart and swells it with joy. Jumby and Shale taught me that. So I have a new dog beside me and we're both sniffing each other out (puppy breath! I die!) and learning whom the other is as we go along. Love will find it's way as will piddles and poop and all things puppy related. In the meantime, say hello to my newest family member. Happy New Year everyone. I hope it treats you well.